The Second Council of Lyon was the fourteenth ecumenical council of the Catholic Church, convoked on 31 March 1272 and convened in Lyon, France, in 1272–1274. Pope Gregory X presided over the council, called to act on a pledge by Byzantine emperor Michael VIII to reunite the Eastern church with the West. The council was attended by about 300 bishops, sixty abbots and more than a thousand prelates or their procurators, among whom were the representatives of the universities. Due to the great number of attendees, those who had come to Lyon without being specifically summoned were given "leave to depart with the blessing of God" and of the Pope. Among others who attended the council were James I of Aragon, the ambassador of the Emperor Michael VIII Palaiologos with members of the Greek clergy and the ambassadors of Abaqa Khan of the Ilkhanate. Thomas Aquinas had been summoned to the council, but died en route at Frosinone. Bonaventure was present at the first four sessions, but died at Lyon on 15 July. The main topics discussed at the council were the conquest of the Holy Land and the union of the Eastern and Western Churches. The first session took place on 7 May 1274 and was followed by five additional sessions on 18 May, 4 or 7 June, 6 July, 16 July and 17 July. By the end of the council, thirty-one constitutions were promulgated. In the second session, the fathers approved the decree Zelus fidei, which contained no juridical statutes but rather summed up constitutions about the perils of the Holy Land, the means for paying for a proposed crusade, the excommunication of pirates and corsairs and those who protected them or traded with them, a declaration of peace among Christians, a grant of an indulgence for those willing to go on crusade, restoration of communion with the Greeks, and the definition of the order and procedure to be observed in the council. The Greeks conceded on the issue of the Filioque (two words added to the Nicene creed), and union was proclaimed, but the union was later repudiated by Andronicus II, heir to Michael VIII. The council also recognized Rudolf I as Holy Roman Emperor, ending the Interregnum. Wishing to end the Great Schism that divided the Eastern Orthodox Church from the Roman Catholic Church, Gregory X had sent an embassy to Michael VIII Palaeologus, who had reconquered Constantinople, putting an end to the remnants of the Latin Empire in the East, and he asked Latin despots in the East to curb their ambitions. Eastern dignitaries arrived at Lyon on 24 June presenting a letter from the Emperor. On 29 June (the Feast of Peter and Paul, patronal feast of the popes), Gregory celebrated a Mass in St John's Church, where both sides took part. The Greeks read the Nicene Creed, with the Western addition of the Filioque clause sung three times. The council was seemingly a success, but did not provide a lasting solution to the schism; the Emperor was anxious to heal the schism, but the Eastern clergy opposed the decisions of the Council. Patriarch Joseph of Constantinople abdicated, and was replaced by John Bekkos, a convert to the cause of union. In spite of a sustained campaign by Bekkos to defend the union intellectually, and vigorous and brutal repression of opponents by Michael, the vast majority of Byzantine Christians remained implacably opposed to union with the Latin "heretics". Michael's death in December 1282 put an end to the union of Lyons. His son and successor Andronicus II repudiated the union, and Bekkos was forced to abdicate, being eventually exiled and imprisoned until his death in 1297. He is to this day reviled by many in the Eastern Church as a traitor to Orthodoxy. The council drew up plans for a crusade to recover the Holy Land, which was to be financed by a Knights Templar. Finally, the council dealt with the Imperial throne, which Alfonso X of Castile claimed. His claim was disallowed by the Pope, and Rudolph I was proclaimed King of the Romans and future emperor on 6 June. ^ ”Le Pape Grégoire X s’efforce alors de mettre sur pied un vaste programme d’aide à la Terre Sainte, les “Constitutions pour le zèle de la foi”, qui sont acceptées au Concile de Lyon de 1274. Ce texte prévoit la levée d’une dime pendant trois ans pour la croisade, l’interdiction de tout commerce avec les Sarasins, la fourniture de bateaux par les républiques maritimes italiennes, et une alliance de l’Occident avec Byzance et l’Il-Khan Abagha" (Michel Balard, Les Latins en Orient (XIe–XVe siècle), p.210. 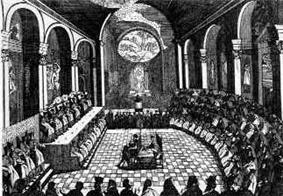 :Catholic Encyclopedia "Lyon, Second Council of"